UMKC Libraries provides several reference service points for users to get help. To improve reference user satisfaction, the members of the Teaching and Learning Department explored student feedback and reference service best practices. After the development of the values, the department discussed strategies for measuring how well we were carrying out these values. A customer satisfaction survey was agreed upon as one way to begin the values assessment. Team discussion centered on how to draft straightforward questions that garnered adequate feedback on the multifaceted values, and how to encourage students to take yet another survey. The group sought to keep the survey simple in hopes of garnering a high response rate. The brainstorming session articulated what individuals appreciated in a simple questionnaire. With undergraduate students as the main demographic, we decided to include emojis as our measure. The emojis would display graphics of different emotions. Qualtrics, an online survey tool, was used to create and deploy the reference customer service values survey. This tool allows multiple choice question types and to insert graphics for answer choices. Once the tool and style of the survey was selected, librarians had to decide how to assess each of the values. 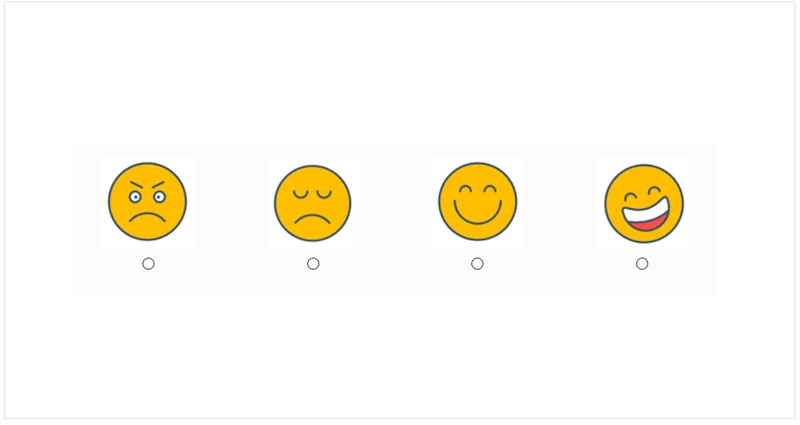 Using a Likert scale, each value was assigned a statement for users to select the appropriate emoji based on their interaction. A text box was also available for users to submit comments. The group decided not to include a statement for fostering enthusiasm as this is a more complex value to assess. The reference customer values survey was deployed during the Spring 2017 semester. Librarians shared the survey at three service points: the service desk, online chat, and reference emails. For ease-of-use, the service desk provided print copies of the survey for users to complete. The number of responses included 13 from the service desk, 30 from online chat, and 2 from reference emails. The user survey proved to have mixed utility as an assessment tool. On the positive side, most users gave us the happiest of emojis. Results indicated only one sad face. The few users who left comments reiterated their praise for the librarians. Yet, this almost exclusively positive feedback had the librarians question the usefulness of the assessment, as it provided little sign of how to improve. 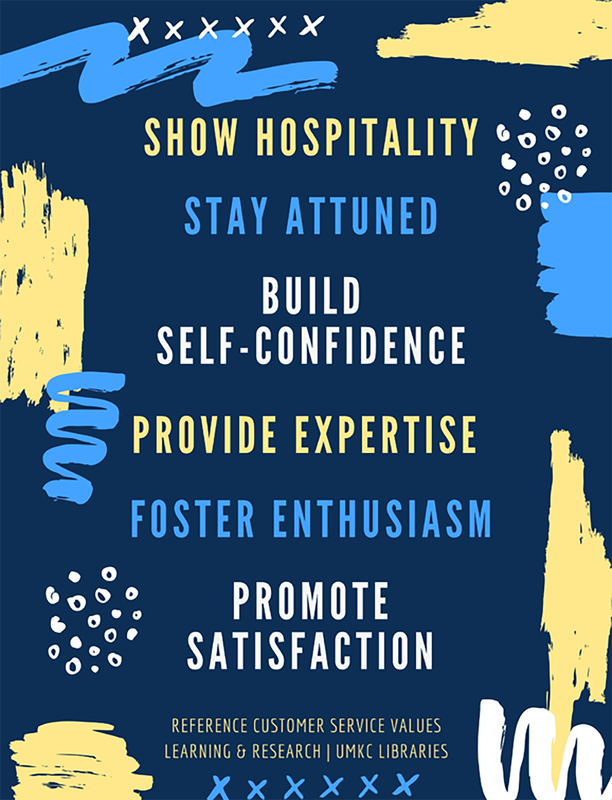 As UMKC Libraries strive to keep our values as a central focus in our work, librarians will continue to explore how to assess interactions to drive continuous improvement. Online survey tools, such as Qualtrics, provide simplicity in user engagement and data, but can be limited in garnering nuanced feedback on customer satisfaction. Future assessment will undoubtedly include such software as one element of a multifaceted approach in determining if we have met library and campus goals. Julie Hartwell is an Instructional Design Librarian at Miller Nichols Library at the University of Missouri-Kansas City. She contributes to the creation of learning objects and instruction for the library’s Research Essentials program and leads the disciplinary instruction team. Mardi Mahaffy is the Head of Teaching and Learning at UMKC, where she oversees the Libraries’ reference and instructional services. When not in the library, you will probably find Mardi seeking out new and novel places to drink coffee. Discussion of "Checking in with Users: Evaluating Library Reference Values"
Version 6 id 1527876 of this page, updated 19 December 2017 by Shalin Hai-Jew. Created by Shalin Hai-Jew.